This is a very popular dish in Italy and has many variations depending on where you eat it. It is very simple to prepare and a joy for the eye and the mouth. To prepare the vegetables: Heat a skillet on high heat with some butter or olive oil, add the vegetable and stir fry until golden brown. Repeat for each vegetable. On to the omelette: Beat the whole eggs in a bowl and add the parsley, pepper, the cheese and mix thoroughly. 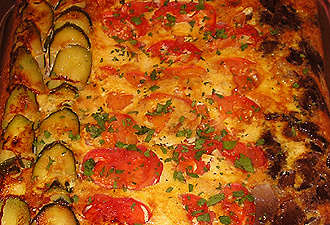 Have a teflon coated oven pan ready (20x30cm) and lay the vegetables into it. If you wish you can use the vegetables to form a pattern (for example: the italian flag, green white and red). Now pour the egg mixture over the vegetables and put into the oven at 200�C for 10 minutes.Can be served hot or cold.